Located between Ka’ena and Kahuku Point, the North Shore of Oahu, Hawaii, is internationally known for its notable surfing, natural beauty, and relaxing island lifestyle. As the boundaries stretch from one point to the next, the land encompasses numerous small towns and villages, such as Pupukea, Haleiwa, and Waialua. Approximately an hour drive from Honolulu, residents of the North Shore enjoy the peace and quiet of their town, yet benefit from the innumerable amenities of the nearby big city. The North Shore’s exquisite beauty and local surfing are what has brought tourists and visitors to its sandy shores for years. The slow-paced lifestyle and small island feel attract residents to escape the major tourist hotels and developments in Honolulu. With famous surfing spots such as Banzai Pipeline and Waimea Bay, numerous surf competitions are held annually. You may snorkel in Shark’s Cove, watch the green sea turtles emerge on Turtle Bay, or relax on one of the North Shore’s beautiful white sand beaches. The town of Haleiwa is the central shopping and business district on the North Shore, yet still considered a small community encompassing a family-friendly orientation. You will find many amenities in the Haleiwa Town Center, such as restaurants, supermarkets, and numerous art galleries. Home buyers searching in the North Shore area will be pleased to find beautiful locations and wonderful real estate options available. 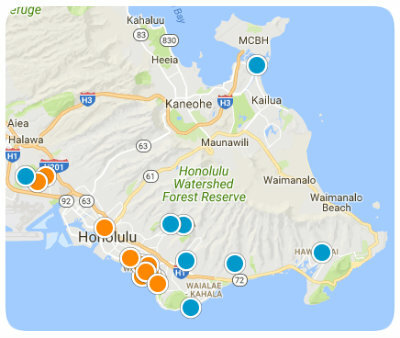 From Pupukea to Haleiwa, home buyers can choose from single-family homes, apartments, or large estates. Whether you are searching for a beach cottage nestled in the lush valley, or an oceanfront estate with views of the vast Pacific, you will find these options and more on the North Shore. From affordable starter homes and townhomes to luxurious mansions, home buyers will surely find a home to accommodate their budget. Because of its undeniable natural beauty, serene beaches, and fun recreation, the North Shore offers all its residents an unforgettable living experience. If you would like more information regarding homes for sale near the North Shore of Oahu, please allow us to assist you and contact us today.